Leading Manufacturer of lab furniture, laboratory furniture and laboratory benches from Coimbatore. We are the Leading Manufacturer and Exporter of Lab Furnitures in Coimbatore, India. Using our vast industrial experience we bring forth a wide range of Lab Furniture for our clients. These products are manufactured under the guidance and supervision of our experts and professionals. Owing to features of our products, clients prefer our lab furniture so that the quality of their utility products and processes are consistent and maximum. Our furniture is used in various colleges, offices, schools, laboratories and many other industries. 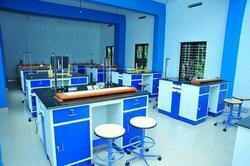 We are the Leading Manufacturer and Exporter of Laboratory Furniture in Coimbatore, India. We are one of the leading manufacturers of Laboratory Furniture. We have a wide range of cabinets, cases and counter-top material. Our exquisite and quality range of cabinets comprises of base cabinets, acid and flammable storage cabinets. The high quality cabinets we offer to our clients helps them in a proper functioning and storage of their products. Our experts quality test the products on various parameters and are in huge demand across the globe. With the valuable assistance of skilled team of professionals, we are engaged in offering an extensive range of high-quality Laboratory Benches.